It is early evening, and our chart covers a much larger section of sky than we usually display. We are showing the sky’s southeast quadrant – from east-southeast (where the moon lies) to south-southwest (where the star Spica resides). As seen from mid-northern latitudes, this evening’s line-up of lights – the moon, the stars Antares, Zubenelgenubi and Spica – arcs rather low across the southern sky. The farther north you live, the lower this arc of lights. The farther south you live, the higher. 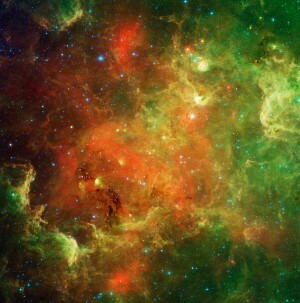 In fact, if you are as far south as Australia, you will see this celestial line-up swinging high in your northern sky. The ecliptic on this sky chart represents the Earth’s orbital plane projected onto the stellar sphere. Tonight’s moon and three key stars – Antares, Zubenelgenubi and Spica – enable you to visiualize the ecliptic (Earth’s orbital plane) this evening, though Zubenelgenubi may be hard to spot because of the lunar glare. 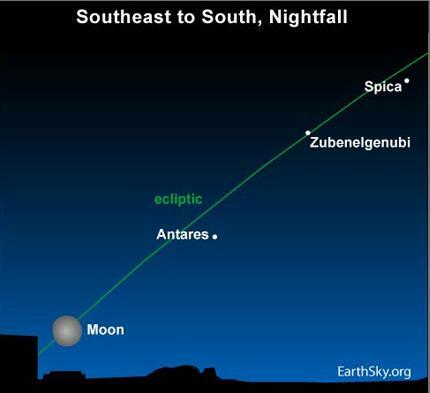 On a dark, moonless night, watch Zubenelgenubi spring out in between Antares and Spica. Antares lords over the constellation Scorpius, Zubenelgenubi wins the alpha star designation in the constellation Libra, and Spica beams as the brightest star in the constellation Virgo. Incidentally, tonight’s moon sits in front of the constellation Sagittarius. The ecliptic passes through the constellations of the Zodiac, as illustrated on our June 12 chart.